This week we had our last Thursday Track Session for the year. Many thanks to everyone involved, either volunteering, supporting or running. Congratulations and well done to all, who managed to reap the benefits of hard training and made strides towards achieving your running goals and running better than ever before. The end of 2016 is near and the road running season comes to an end. It is time to take stock and review what has been achieved. In this week’s Hare Brain Blog, we evaluate the effectiveness of the Thursday Track sessions by analysing the attendance statistics, how session attendance correlate to performance improvements and the impact on raising standards within the Mornington Chasers Running Club. Two weeks ago, I had an impromptu conversation with Stephen Sash. It went like this. “What are you doing?”, he asked. “I am just ticking off those who attended tonight, trying to work out what makes folks train and coming back every week.”, while holding tight to my clipboard. “Do you know the concept of cause & effect?” he said in a challenging manner. “Sort of, but go on …”. Stephen concluded, “I believe folks come back because of they want a PB and want to get better!” “Maybe, but I don’t know for sure. I am interested in triangulating behaviour, level commitment and performance improvement. Looking at attendance is a good starting point.” We don’t want to embark on a big number crunching exercise or a formal hypothesis test. Let keep it simple and look, let’s have a look at the data. Unfortunately, I do not have a full record of attendance for the whole year. I started coaching in April. It took a while to get to know those who take part in the Thursday track session. Initially, I tried to record who attended the training session on a best endeavour basis, though failed to do it consistently. The purpose of maintaining a record was to be able to address everyone by name. A couple of months later, a core group emerged who attend most Thursday track sessions, so I expressed an interest how their performances progress throughout the season. Since April, we delivered 37 track sessions. Many thanks to Chris, John, Adrian, Louise and Alice helping out when I wasn’t on duty. I recorded the attendance of the last nine track session. The sample size is incomplete. On every occasion, there were a few more members taking part than I managed to record. Further, I did record those who could not attend the session but did the same session on their own. Recording the attendance served the purpose of getting an understanding who attends on a regular basis or those who do a few sessions and then have a break. A couple of years ago, I did a similar exercise. There are multiple reasons for why folks attend or not attend. It’s highly individual and in many cases having the time available to take part is the biggest constraint. Let’s focus on the positive and look at those who attend on a regular basis. Between October and December, 66 Mornington Chasers took part in the Thursday sessions. Glad that not all attended in a single session, that would have been hard to manage. Given the membership subscriptions have increased to 300, more than a fifth of the club has been to Parliament Hill Athletics Track on a Thursday. There have been slightly more male members than female members to the session. 58% of the attendees are male, while 42% are female, a good sign that we have a well-balanced training group. Our busiest period within the last nine weeks was the end of October and November. Attendances peaked at 30. Seasonality, in the run up to Christmas with all the important races out of the way, December is a busy time for most lead to a drop in attendance levels. On average 24 members attend every week. There is a pool of dedicated runners who attend the sessions on a regular basis. This trend is very reassuring. Those who train consistently without getting injured are reaping the benefits as their speed develops. There is not a single athlete, who managed to attend all the nine sessions. Two athletes who attended eight out of the nine sessions have done well. A further two athletes attended seven sessions. A third of the Thursday tracksters attended at least more than five sessions. The majority, approx. Two-thirds are more opportunistic in their attendance. Next, we looked at the level of commitment by ability. We could not identify a trend within the group who attend more than five sessions. Hence, there is no major difference based on those who come more than 50% of the sessions. 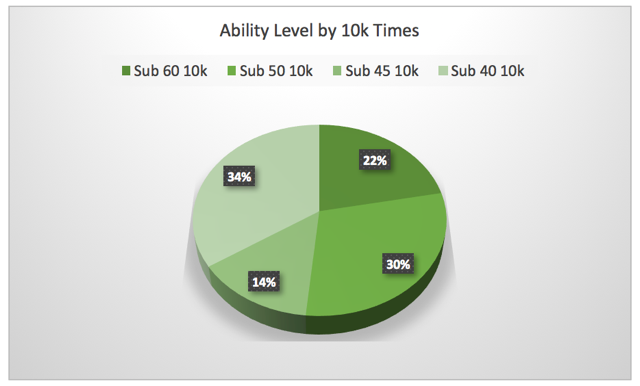 There are higher numbers for the sub 50 and sub 60 minutes 10k runners who only attend once. This suggests that the training is less suitable for runners new to track training. In future, we will continue to record attendance. This allows us to understand, who takes part in the training and helps us in our planning when dealing with the Corporation of London. We pay an annual fee for using the track and our fee is based on an average number of athletes training on the track. Understandably, we want to make the best use of club funds and don’t want to be over charged. There is an opportunity to convert those between 30% to 60% of attendance towards a higher attendance. However, this would mean that on a single night there would be 30 to 40 runners, a situation hard to manage for a coach, an additional session or 2-3 support coaches would be required for delivering safe sessions. Runners like to come if they know what is expected, sessions are suitable, structured and if there are part of a conducive environment. If it is a good experience and if the support is in place then runners will make up the time, commit and attend on a regular basis. To make this happen, leaders within the various ability groups create a sense of cohesion and shared purpose when training together. When that is in place, everyone benefits. During the last six months, many of the regulars recorded personal bests over the 5k, 10k, 10m and half-marathon distances. 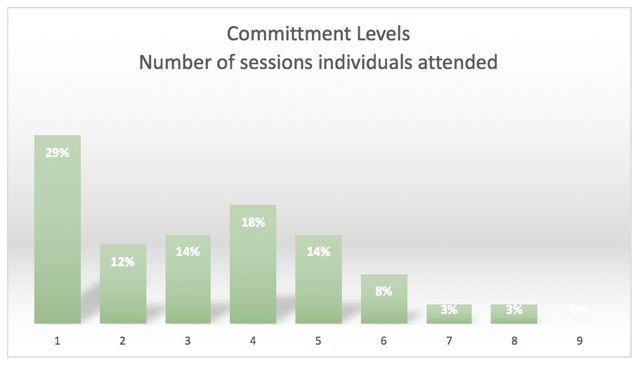 A closer look at those who attended more than 50% of the last nine sessions reveals that there is a strong correlation of those who attend on a regular basis achieve more. 3 of the most regular attendees, all at different abilities of the Thursday track night managed the triple, i.e. to run a PB in the 5k, 10k and ½ marathon. This goes to show, that willing to train hard, regardless of ability will see improvements of their personal bests. There has been many more PBs too and likely others as well, though there were attending less than 50% of the sessions. There were a couple of more candidates, though they either didn’t do a ½ marathon or have not done a 5k. Regardless, very well done to those who managed to get close to their best times or improved on their personal bests. It’s always a big confidence boost and opens up new possibilities. As one former coach said, champions are everywhere, they just need to be trained properly. How we are doing as a club? Let’s look at the wider context and how the club is positioned. There is no nationwide club ranking system as such or an agreed measure what good or bad means. For the sake of simplicity we applied the same model England Athletics has been using for their ‘Club Run’ campaign, which is typically targeted towards Road Running clubs. The model was suitable, because the majority of the membership compete in road running events. 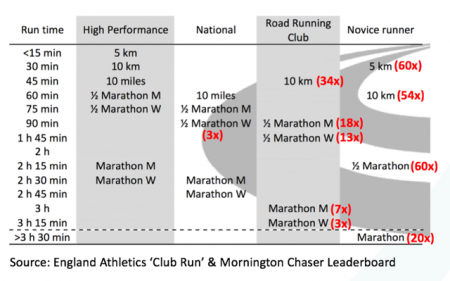 While the club has active triathletes and a small, enthusiastic track & field athletes, the Mornington Chasers classify as a Road Running Club. 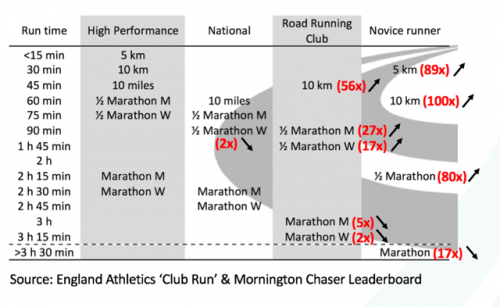 In terms of performance, there is no difference to many other road running clubs. There are many clubs in the South East of England at a similar size. The club has a solid base and the majority are novice and recreational runners engage the club’s training offerings. 10% of the members achieve a notable higher standard, 1% are getting close to a regional/national levels, those typically engage in more structured training and take part in the coached sessions. This split is not unusual and very similar to many road running clubs. In comparison, Serpentine RC, one of the biggest running clubs in the UK, while strong at the sharp end of the performance spectrum have approx. 6% senior men with a sub 40 minutes and 2% senior women running sub 45 minutes for the 10k. Relative to its size, Mornington Chasers stack up well. It is encouraging that membership subscriptions went up and current members keep on renewing their membership. This means more runners get engaged in training, more compete and more will progress, resulting in raising standards across endurance events. Important, here is that an inclusive training platform is provided, this means that there are pathways for those training at similar ability levels and providing opportunities for runners to improve at all ability levels. For that reason we have tailored our track sessions based on ability. In comparison to the previous year, 2016 has been a very good year for the Mornington Chasers. More members engage in 5km and 10km events. The uptake on 10km races has almost doubled, which is very encouraging. Our training throughout the summer focused on improving over the 5k and 10k distances. The Chase the Pace 30th Anniversary event was a great opportunity to get members running a 5k and 10k on the track. Overall we have now more sub 45 10k runners than before, 29 of them are sub 40 mins. There are few women close to the 40 mins mark, who will continue to develop and progress further. Taking part in the half marathons has increased too, the club’s more coordinated approach towards selecting half marathons engages more runner. The overall uptake and the number of top performances for the marathon has slightly been down compared to last year. However, we have not yet completed a full year and plans have been put in place to raise the standards for the marathon. For 2017, we want to build on what has been achieved in 2016. The first couple of month will focus on the spring marathons and we aim to get more runners getting involved in a spring marathon. Then we continue with the 5k/10k focus before stepping up the half marathon distance in autumn again. During the last couple of weeks, a number of suggestions have been raised, which we discussed. For some members, starting the session at 7:30 pm is quite late, an earlier start would be preferable. A good idea and it would allow us to extend the session beyond 1 hour. However, for many of the regulars and coaches, it is already a stretch to make it to Parliament Hill on time for a 7:30 pm start. Often, I manage to arrive at 7:15 pm, which leaves just a couple of minutes to get changes and setup. On balance, 7:30 pm is a good compromise. For now, we will continue to start the session at 7:30 pm. Some feel the warm-up takes up too much time and is too long. Typically, a warm-up can last 15 to 20 minutes. The proposal would be to skip the warm-up. Coaches plan the session and are responsible for the content. Personally, running a safe, fun and fulfilling session has to be a priority for all. Secondary, the warm-up plays an important part in the session and is often the only element of the session where any athletic skill development happens. My practical experience of coaching many sessions over a decade is that a group warm-up is always a safe option and prevents injury. When athletes don’t warm-up or when every athlete is doing their warm-up for themselves, then this often lead to injuries. Most weeks we do some intense training and the warm-up part of the session. As many come direct from work and rush to the track allowing 10 to 20 minutes window to refocus the mind is a good way to prepare athletes for the session. The warm-up is a mandatory part of the session. We cannot skip it! The majority of the sessions are 5k and 10k speed development or speed endurance type sessions. The sessions are not specific for marathon runners or middle distance runners. If we would provide event specific sessions, then there would be fewer athletes available running in the same event specific session. Running long and middle distance sessions in parallel require more coaching support. My view is each event requires a coached session in its own righ. Mixing too many workouts in one session distracts what athletes/group want to achieve. As you noticed, sometimes we go a bit longer until the flood light gets switched off. A few runners are keen to complete the session and like the challenge. I am supportive of this and don’t want to enforce restrictions. We usually plan the session and give guidance, that all can complete the session on time. We provide choice Group A/B type, though ultimately it is up to each individual what sessions they want to run. We do a lot of interval training. Another suggestion was to run a 5k time trail on the track. From a coaching point of view, a great way to capture data and determine baseline fitness. However, many of you take part in parkruns and want to train on the track and not compete in another 5k. We may use a time trial for shorter distances, 2k, 1 mile or 1.5k, though not the full 5k race distance. As you noticed, we never take enough time to stretch after the session. Some do a couple of static stretches, others get quickly changed and get on the bike and cycle home. I would advise after a short cool down to get quickly changed and perform a small number of static stretches. I have done many sessions, which include a stretching routine, though those sessions last typically 1h 15 minutes. The attendance levels throughout the last six months have been good. Everyone is familiar with the structure. There is a good core of regulars. At this stage, there is no need to change the session arrangements. Based on attendance levels and performances, the club progressed and raised performance standards. The majority of the Thursday track regulars set personal bests in almost all distances. In 2017, we will build on the successes of 2016 and continue to provide a training platform to those who want to train, compete and become better athletes. Having fun, the willingness and commitment to train hard, take part in the club’s targeted competitions, acquire new athletic skills, adapt to training, while remaining injury free should be our focus for 2017. I hope you found the recent blog posts on the Hare Brains blog useful. If there is anything else you want to know then please get in touch. I am looking forward seeing you back on track in 2017. Well done to those who attended week in week out and worked hard to improve. I want to wish you all a merry x-mas and a relaxing Christmas break. Enjoy your running, start thinking about 2017 and I look forward to seeing you back in January for our Thursday track session. Every couple of months, England Athletics invites the leading coaches on the National Coach Development Programme (NCDP) based in the South-east for a get together at St. Mary’s University College in Twickenham. I have been to various gatherings over the years and those sessions never disappoint. The wealth of experience and willingness among coaches to drive athletics forward is something I always find inspiring. Special thanks to Neville Taylor, National Coach Mentor for Endurance, for putting together a packed agenda. This year’s NCDP coaching seminar theme was on ‘Aim higher’. The next Olympic cycle is already upon us and what has worked so far for the last 4 years, may not be good enough anymore to qualify for the 2020 Olympics and make the podium. Future performances such as sub 1’40’’ (800m), 3’26’’ (1,500m) or even the sub 2-hour marathon are discussed among athletics pundits. While these are big challenges, pushing the boundaries is the first step towards improvement. When we do not start to plan for it, it will unlikely happen, and then we will not strive towards improvement says Neville Taylor. This session on ‘Aim higher’ provides the context to explore how training would need to change to enable athletes to reach the next level. The seminar started with a practical session led by Richard Blagrove. Richard is a Senior Lecturer for Strength and Conditioning at St. Mary’s University College and has authored a book with the title ‘Strength & Conditioning for Endurance Running’. The aim of the practical session was to assist coaches with screening and testing technique when working with athletes, regardless of their age. Screening and testing help to assess the athlete’s muscular and functional strength and weaknesses. Once the coach understands the athlete’s specific demands, remedial strategies to strengthen joints, muscle and improve movement patterns can be put in place, which helps to prevent injury and enable the athlete to do more event-specific work. The screening and testing tools were general strength exercises along the specificity continuum. Richard introduced a set of low/high load exercises and capacity tests and explained to coached what to look out for. Coaches experimented with the exercises (single leg bridge, standing rotation, walking lunge, side hold, etc. ), gave each other feedback and identified variants of the movements as remedial actions. The majority of exercises were related to hip strength, correct pelvis position and maintaining a static core. The scoring in those tests help during athlete profiling and develop improvement plans, which prevent injury and drive performance. A very useful clinic and Richard busted some myth about strength & conditioning and highlighted some common exercises used by many endurance athletes, which are rather counterproductive to core strengthening. Dr Kate Spilsbury, Physiologist with British Athletics, provided an overview of British Athletics’ Altitude Programme. Since the first altitude trips, the altitude programme has evolved and matured. What was initially perceived as a ‘holiday trip’ for athletes, has now turned into a thoroughly planned, high-tech expedition. Top endurance athletes, depending on their season goal, apply multiple altitude camps a year. Between November and January, athletes have been attending the High Altitude Training Camp (HATC) in Iten, Kenya for typically 3 to 4 weeks. The aim is to accelerate the development of aerobic fitness. In November to January, Iten in Kenya at 2,400m is ideal and has favourable weather and altitude conditions. However, for some athletes getting from the UK to Iten is a very long and tiring journey. Font Romeu, from the UK, is more accessible, though the weather is more unpredictable during the off season. Further into the season, British Athletics uses Font Romeu in the French Pyrenes or for US based athletes Flagstaff and Park City as altitude camps. Those locations enable athletes to stay at a lower level of altitude and do more intense sessions at a lower altitude while staying for the rest of the time at a higher base. 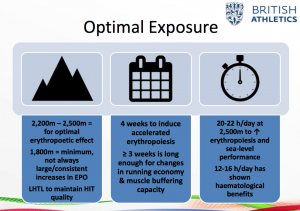 The research found that complementing altitude camps with altitude tents at sea level has an accumulative effect and helps the athletes to maintain and even increase high haemoglobin levels. A couple of coaches were critical of the benefits of altitude training. The change in environment and the adaptations of the training programme was seen more as a risk than a benefit. It was pointed out that early adopters of altitude training in the 1970s and 1980s went to altitude and continued with the same amount and intensity they were used to at sea-level. When at altitude, depending on the level, intensity is reduced. High intense workouts are done sparsely, i.e. after 2 easy days, a more intense session follows to allow extra recovery. Further determinants of a successful altitude camp are better understood and controls are put in place to ensure that athletes arrive fit, healthy and conditioned at altitude to maximise the training effect. To my surprise, British Athletics approach to altitude camps is quite controlled and regimented. The camps have clear objectives and measurements have to be in place to support those. Athletes are closely monitored on a daily basis and ensure that they follow their personalised training and not training too hard or join sessions of local athletes. The data gathering helps British Athletics to continuously improve and optimise the programme and get an in-depth understanding of the benefits and physiological changes in athletes of altitude training. In contrast to the official British Athletics altitude programme, Mo Farah, Charlie Grice and Adam Clarke went to train in Ethiopia. However, all stayed in Kenya first before moving on to Ethiopia. It was highlighted that Mo Farah attended many altitude camps and spent a lot of time throughout the year at altitude, consequently his body is already adjusted. To gain extra benefit Mo Farah has to train at higher altitudes in Ethiopia and in addition use an altitude tent. The highlands of Ethiopia are flatter compared to Kenya. Charlotte Purdue has been training at altitude in Falls Creek in Australia and is preparing for an altitude camp to Dulstrom in South Africa. Both locations are not part of the British Athletics altitude camp, though frequented by many international runners. Another coach asked if athletes offered US scholarships should rather choose a university located at altitude. Kate confirmed that spending 3 years at altitude could be very beneficial for their performance and long term development. The founder of Affinity Altitude Ray Matthews (Brighton Phoenix) presented his latest range of altitude tents. Ray, a club mate of the 1,500m runner Charlie Grice, assessed the altitude tents available on the market and thought he could improve and simplify the usability of those tents. Affinity Altitude offers two models, the ‘Oxy Hood’ and the ‘Oxy Wagon’. The Oxy Hood is a small version of the Oxy Wagon and fits around the upper body, while the Oxy Wagon covers the whole double bed. The altitude tents enable athletes to simulate altitudes of up to 3,500 meters. Ray tried the altitude tent out for himself. After a couple of weeks, despite reducing his training load by 50% he kept on improving and maintains a mid 17 minutes 5k as a V50. He attributes the improvement to sleeping in the altitude tent. British Athletics has some units in circulations, British Cycling tested the tents with their cyclist too and received positive feedback, while the tent is also beneficial for triathletes. The altitude tent comes with a generator (40 dBA) and starts from £1,900. These are possibly worth 2x altitude trips to Kenya. However, as pointed out by the British Athletics, the altitude camp and staying at the tent at sea levels makes the difference to maintain a high level of aerobic fitness for longer. The responses among the coaches were mixed. While I am a strong advocate of altitude training camps, some of the middle distance coaches were sceptical about the value add such tents have. As we heard, leading athletes like Mo Farah and Matt Centrowitz use altitude tents all the time. One of the issues identified is that what is the effect when sleep gets interrupted, or one has to leave the tent. Further, a recommended minimum of 10 hours sleep is required, not an option for many athletes in full-time employment. Elliot Giles, bronze medal winner in this year’s European Championships in the 800m talked about changing his coach and getting used to the new training regime. Matt Yates, a retired international middle distance runner, coaches Elliot. Elliot, still U23, is learning and getting familiar with the coaching process. Matt Yates quickly fills in the gap and entertains the room with his latest methods (Cognitive Behaviour Therapy) he has seen used by drug addicts for getting Elliot to reinforce his new regime. Next, Matt states that athletes should not limit themselves by thinking they cannot beat the Africans in important races. It seems to have worked well so far. Elliot made a significant improvement, earned a medal at the European Championships, made it to the Olympics and gained a lot of experience. An exciting athlete to watch. Charlotte Purdue ran her debut marathon in the 2016 London Marathon (2:32:48) and narrowly missed out on making the team for the Rio Olympics. Charlotte changed coaches and is now coached by Australian coach Nic Bideau. Despite at young age, Charlotte always felt positive about the marathon and enjoys the training. Previous VO2Max tests suggested that she is particular suited for the more longer distances. Her long term aspirations is to make the Tokyo Olympics in 2020. Her next goal is to compete in the World Championships in London next year. Charlotte talked about her build up for the Berlin Marathon. Unfortunately, the night before the race she felt sick and dropped out of the race the next day. A frustrating experience, though Charlotte quickly re-focussed and her coach entered her in the Frankfurt Marathon. She had a good race in Frankfurt and managed to run 2:30:04 and felt she has found her event. She wants to progress further in the marathon and want to follow the likes of Benita Johnson / Mara Yamauchi and progress towards 2:25 in the marathon. Many coaches in the room assumed Charlotte or Elliot are on lottery funding. Charlotte is a self-funded athlete, works part-time as a personal trainer/pilates teacher and funds her own altitude camps. Unlike other athletes on the funded programme, she does not receive the same amount of medical support from British Athletics. Coaches highlighted that there are many athletes trying to transition from national to international athletes or after coming back to the UK after their US scholarship in a similar situation. A kit or shoe sponsor supplies equipment rather than funds. This leaves athletes, not on funding trying to make their own arrangements. It is less the long term financial incentive that drives athletes rather than the prospect of performing at their full potential. Thanks to some sponsorship Elliot is a full-time athlete. He knows that he has to deliver results too to maintain his status. Unfortunately, from a coaching perspective, there was little detail on the actual training programme. For example, peak mileage, typical build up, peaking, carbo-loading regime. 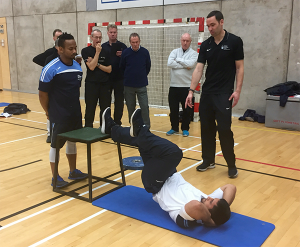 An insightful day at St. Mary’s which facilitates learning among coaches, sharing idea and contextualising strength & conditioning into their coaching reality. Not all of us have the means and opportunity to attend an altitude trip, though Font Romeu is only a flight away to Barcelona and a 2 hour drive. 1-2 weeks has benefits and accelerates aerobic fitness. For those keen to perform close to their full potential, altitude training is a must. 2015 I spend a week in Iten, Kenya and definitely benefited. The winter season is upon us. After all the club championship races it is now time to either have a break or settle into the winter training. When the weather changes and gets a bit colder doing hard, long intervals are not so much fun. When approaching December, it is time to take the foot off the gas and take it a bit easy and have some fun. Traditionally, early December is an ideal opportunity to introduce the Oregon Circuits, one of my favourite sessions are the Oregon Circuits. In this week’s ‘Hare Brain’ blog we explain a bit more about Oregon Circuits. Oregon Circuits, as the word suggests have been invented at the University of Oregon. It was coach Luiz de Oliveira, who came up with the workout when coaching the Brazilian middle-distance runner Joaquim Cruz while studying at the University of Oregon. Later on, Cruz won the 800m gold medal in 1984 Olympics and beat Steve Ovett and Sebastian Coe. Later on, Cruz won the 800m silver medal in the 1988 Olympics too. Cruz still holds the South American area record. He is only one of five men, who have run sub 1:42 (1:41.77). Today, Cruz train Paralympic athletes and applies the same training fundamentals he used to follow. The first time I came across the Oregon Circuits was when I met the late Dave Sunderland, coach to many international athletes. Dave Sunderland spoke about coaching middle distance runners and the type of training distance runners would do in and outside the season. When coaching at the Serpentine Running Club, I adopted the Oregon Circuits for long distance runners and used to do this session once a month during the cross country season. While this is a tough workout, some of the exercises can be challenging, athletes enjoyed the session and welcomed a break from the more structured sessions. One of the benefits of this session is that athletes have to use all muscle groups and their nervous systems. Oregon Circuits give them a good all round full body workout and promote mental toughness as well. How does an Oregon Circuits session work? 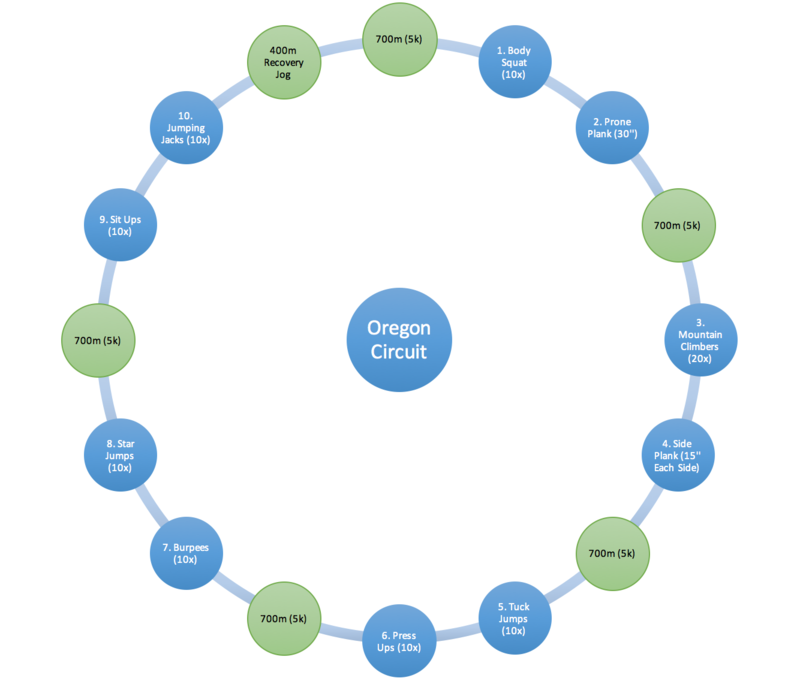 The format of an Oregon Circuit session requires a bit more explanation compared to the traditional interval sessions. However, the session builds on the principles of interval training. The session contains bouts of fast running, interspersed with an active recovery of general strength and core exercises. Depending on the event, training age and the ability of the athletes I use 700 and 300 meter repetitions, use 1 – 2 exercises and two circuits. It is a demanding session and I recommend a cool down jog. Allow your muscles to fully recover and take it easy on the next day. As these are intense sessions, I recommend only one session per week at best. Start with once a month and progress to any other week during your base training period. Start your session from the 1,500m start. Experienced athletes run 700 meters at your 5k race pace. Improvers would either do 300 meters or alternate between 300 and 700 meter repetitions. Once finished with the repetition, jog forward to the high jump area and start with the general strength exercises. Typically, the exercises last 30 seconds with the same amount of rest between exercises. Exercises alternate between upper and lower body exercises. For example, while doing a full body squat, the upper body is less stressed, while the lower body is less stressed when doing a set of press ups. More advanced athletes can alternate between upper, core and lower body exercises. For example, press ups, plank and body squat. There are many ways to progress Oregon Circuits. Start with a small number of repetitions first, then build up the total volume of the session by increasing the number of repetitions and circuits. The same applies to the general strength exercises, though the main focus should be on running specific strength exercises and not on doing as many exercises as possible. Start with one exercise first, then progress to 2 exercises during the active recovery. More advanced athletes can do 3 to 4 exercises and match the duration of running with the total time spend doing the general strength exercises. For example, 700 meters require 2’30’’, then spend 2’30’’ for the general strength exercises. Important to note, don’t rush doing the general strength exercises. Try to understand how to perform the exercises correct first, before doing the exercises faster. Doing the general strength exercises wrong will only increase your risk of injury. On observation, when doing the body squat, athletes try to do this as quickly as possible, just thinking about the effort rather than form. Ensure both feet are shoulder width apart, when moving into a squat position, have your feet pointed forward. Ensure the knee caps are not too far ahead of your toes. Place your hand behind your head and point your shoulder blades together, so that your spine in a stable position. While combining running and strength, the complexity of the exercises can vary and require full concentration. I am a big fan of the Oregon Circuit session. I do this session frequently especially when I am working with a new athlete. The Oregon Circuit workout has pretty much everything. It helps me to assess the athlete’s running form while running in between the exercises and I can see the athletes sense of coordination and determine the level of core strength. Often there is a connection between both. Are there any imbalances or muscular weaknesses? If there are weaknesses, they will be revealed especially towards the end of the session, when the athlete feels more tired and starts to become fatigued. You don’t need a track for doing an Oregon Circuit session. Instead of running a fixed distance, you can run for 1 minute, or do a shuttle run (100 meters out and back) and do the exercises. This session works well on a ‘trim-trail’. Many club standard runners like to do interval sessions throughout the year and are not too keen deviating too much from the format in fear of losing fitness. Oregon Circuits is a great session to break up the routine and combining running with strength exercises in such a way that all muscle groups get a stimulus. Besides the physical benefits on strength endurance, the session schools mental toughness and prepares athletes for maintaining running form in a tired state. Comes spring you will be better prepared to do a more demanding speed workout. Alternatively, similar to Joaquim Cruz when coming back from injury/break, Oregon Circuits are the workouts to recover your full strength.